August is the time of year I start tuning up for the hunting season at the shooting range. This year, I have a mule deer muzzleloader hunt that starts in late September and a center fire elk hunt that starts in mid October, so I barely have enough time to prepare both rifles and myself. Starting a Barnes T-EZ bullet and sabot into the muzzleloader barrel. I admit that I shoot sporadically between the hunting season and August. Since shooting is a perishable skill, even if my scope is still true and my powder is dry, I will be happy to shoot a four inch group at 100 yards with the muzzleloader. If I shoot well, that’s great, but now is the time to find out, not when I’m looking at a big buck on opening morning. Sighting in a rifle, proving that a scope is zeroed and working up a load are not the same things, but all require consistency. If you show up to the range with a newly mounted scope, you should be prepared to stay for a while as you alternate between shooting groups of bullets and adjusting the scope. Working up a load (especially for a muzzleloader) is the process of testing a variety and amounts of powders, bullets and primers to see which combination shoots best in your gun. Obviously, only one of those variable can be changed at a time. In either case, it is important to start at a flat range with targets of known distance. Most of us have laser range finders now, so shooting at 95 or 105 yards when we thought it was 100 yards is no longer an issue. 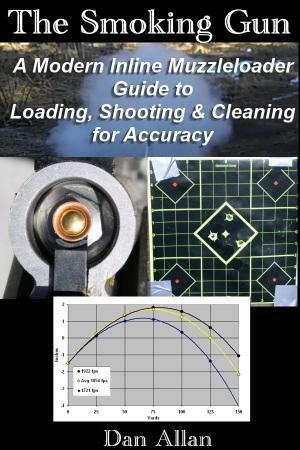 The shooter is the biggest part of the accuracy equation, so if you have access to a shooting vice, use it. The more human inputs that can be removed from the equation the better. Otherwise, use bipods, sand bags, pillows, rolled up towels or whatever you need to hold steady on the target and to make a smooth trigger pull to minimize your effects into the equation. I have already worked up good loads for my muzzleloader for both 250 grain (for mule deer) and 290 grain (for elk) Barnes Bullets (post coming soon). I am hoping to simply prove my scope is already sighted in, so I can start re-training myself to shoot at a variety of distances and angles from different shooting positions. I will start where I left off last year using 95 grains of Pyrodex powder, 250 grain Barnes Spit-Fire T-EZ bullets and sabots and Remington Clean Bore or Winchester 209 Primers. This is a load I worked up for my Thompson Center Encore and so far, has proven to be the most accurate bullet/sabot/powder/primer combination to date. 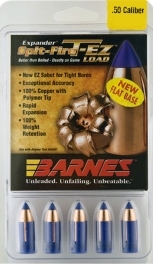 In my opinion, Barnes 100% copper bullets are the absolute best bullets for controlled expansion and weight retention, but the Pyrodex powder and Remington primers are not new or sophisticated products, so there is nothing magical about the components I use. But that combination works consistently in my gun. Each shooter has to discover for themselves which combination of bullet/sabot/powder/primer shoots best in their gun from a consistently cleaned barrel. Assuming my powder has not lost it’s potency or my scope hasn’t been dinged, it shouldn’t take too long for me to reach my goal for the shooting range. That goal being to shoot less than 1.5 Minute of Angle (MOA) or better groups, which is basically 1½ inch groups or less at 100 yards. That will prove my powder is still good, my scope is still true and I still have some ability to hold the rifle properly and squeeze the trigger smoothly. I proved to myself that my Thompson Center Encore was capable of shooting sub MOA groups, using a high powered scope, but I can’t consistently shoot one inch groups with my 1X scope. Many of us mature shooters have issues focusing with open sights that is easily corrected with a rifle scope, but my State only allows unmagnified or 1X scopes to hunt legally during the muzzleloader seasons. The Nikon 1×20 scope has a cross hair height (and width) of 2.88 MOA, so the cross hairs obscure about 25% of a 12 inch kill zone target and 60% of a 5 inch bulls eye at 100 yards. For comparison, my 9X scope has a 0.33 MOA reticle at 100 yards and the cross hairs obscure only 7% of a five inch bulls eye, making it possible to consistently line the cross hairs up on the center of the bulls eye. All in all, I can’t expect much better than 1½ inch groups with a 2.88 MOA reticle. 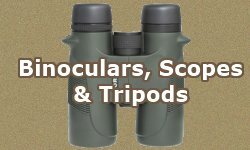 Update – Magnified scopes are now permitted during the muzzleloader season in my state. I got a Simmons 3-9X/40mm 8-point scope for my muzzleloader. I used it during the 2016 muzzleloader hunt and it is unbelievable this scope costs only $40. I am very pleased with the Simmons scope. My normal protocol at the range is to set up two targets. I shoot powder from a clean barrel at one target, then I reload with Pyrodex pellets and shoot at the 2nd target. The obvious goal while hunting is to make a one-shot kill from a clean, cold barrel. I like to practice the second shot just like I would if had I missed the first shot in a hunting situation (knock on wood). 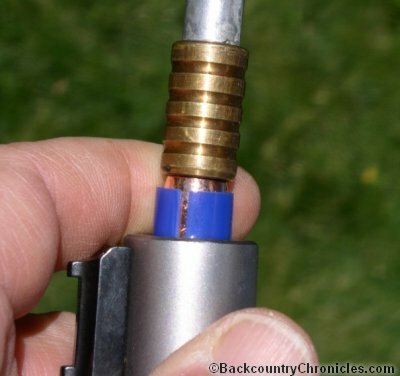 This method is a constant reminder of why it is so important to clean the barrel after each shot when sighting in or working up a load. If you try this, you will see a big difference between the clean barrel shots with carefully measured powder and the dirty barrel shots using pellets. It will give you confidence in what your gun can do with a clean barrel first shot and will also show the limitations of that second shot. I use pellets for second shots because they are easier to get into the barrel when under stress, especially if I had to lie down to to hide from game while reloading. Last year, my first clean barrel group was spread just about three inches. The wind gusting at our backs might explain an inch or so. I cleaned the barrel after each shot on that target, so the barrel may have been getting warm but was not hot. It appeared my powder was still good and the scope was still right on, so at least two inches of shot variation was most likely my problem. After shooting just a few groups, my shooting became more consistent and I was creeping in on my goal, but still needed a little improvement. But when a new shooter set up beside me and started shooting a 300 win mag with a ported barrel, he had all of us flinching even when we weren’t shooting. I decided I had spent enough time at the range and my two inch groups were going to have to be good enough. Time to move on for more practice in the field. For a hunter, practicing at the range is primarily for the gun, to prove that the scope is true and secure and for muzzleloader hunters, that the powder/bullet/sabot/primer combination is accurate. Practicing in the field is for the Shooter. Shooting at the stationary 100 yard target from a comfortable bench is just the beginning of practice, the bare minimum, not the end goal. 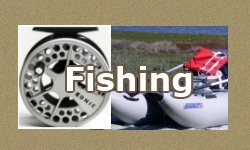 It is only the first step before moving to an area where we can practice shooting from a variety of distances and angles as we expect to find when we are hunting. Don’t get me wrong, going to the range is a good start. We have all heard too many stories about guys hunting without even checking to see if their scopes were sighted in. Don’t be that guy and don’t hunt with that guy. Friends don’t let friends hunt without sighting in. Muzzleloader Accuracy: Are Six Inch Groups Good Enough for You? I have a 22” Knight Muzzleloader wolverine I just bought. I would like to get info on a good lead bullet to start with. I have a hunt I drew in Idaho this year and need some info. Welcome to the muzzleloader community. Where to start? If I had a new muzzleloader, I would like to talk to someone that shot the exact same gun to find out what bullet and load combination gave them the best result. That bullet/load combination will depend on what you will be hunting. 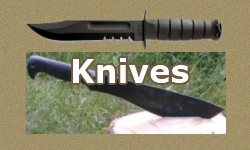 Are you looking for a swaged conical bullet or a sabot? Any particular reasons you only want a lead bullet? I wrote the Modern Inline Muzzleloader Guide because I didn’t have good information when I started and had to figure everything out for myself. In fact, I got lots of bad information. Congrats on drawing the tag in Idaho. What tag did you draw? And what info do you need? Are you familiar with Idaho? 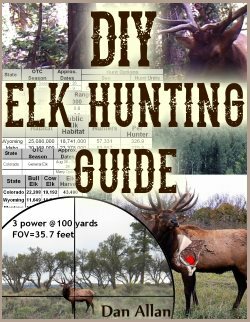 I wrote the DIY Elk Guide not just to help people decide where to hunt, but also to let people know something about the different habitats, logistical issues and backcountry safety issues especially for people not familiar with the vast areas of the West. Since you already have a tag, you know where and when you will be hunting. 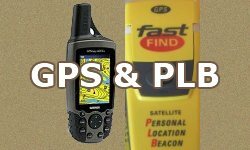 The Elk Guide will also show you good places to find the information about public land in your hunt area.